The Stormers continued an impressive recovery from a stumbling start to the Super Rugby season when they outclassed the Jaguares 35-8 in Cape Town Friday for a bonus-point victory. The Stormers suffered a humiliating 37-point loss away to fellow South Africans the Bulls in the opening round of the southern hemisphere franchise championship last month. But they then clawed back to edge the Lions and the Sharks and were far too good for the Argentinians at Newlands Stadium after building a 16-8 half-time advantage. 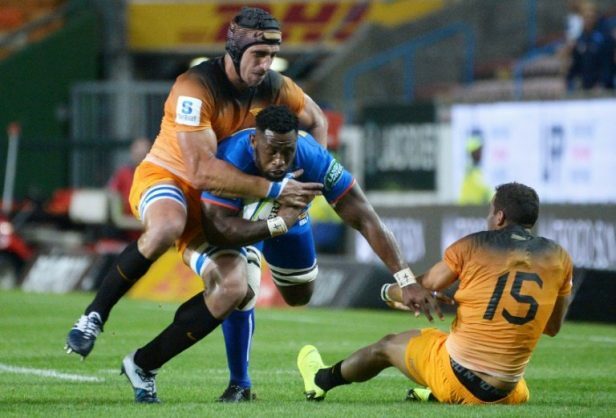 A key phase of the game came early in the second half when a surge from lock Guido Petti took the Jaguares close to the Stormers tryline, but they failed to score. Play switched to the other end of the pitch and Stormers and Springboks skipper and flanker Siya Kolisi spotted a gap to score from close range. Winger SP Marais, whose flawless goal-kicking yielded 13 points, converted to give the Cape Town outfit a 23-8 lead. Jaguares thought they had got back into the game soon after when prop Santiago Medrano scored, but the try was disallowed after a TV review revealed a knock-on. The Kolisi try effectively ended the match as a contest and it then became a race against the clock for the Stormers to score two more tries and bag a bonus point. They succeeded with two minutes to spare thanks to tries from two scrum-halves, starter Herschel Jantjies and substitute Justin Phillips. Both scored from close range, exposing gaps in the Jaguares’ defence at rucks, as Kolisi did earlier. “We played much better in the second half,” said Kolisi, who last year became the first black Test captain of the Springboks. “I attribute that to patience, being extremely competitive at the set pieces, and showing patience when trying to break through the Argentine defence. The Stormers play the Hurricanes and Blues in New Zealand before tackling the Queensland Reds and Melbourne Rebels in Australia. Centre Dan du Plessis, Kolisi, Jantjies and Phillips scored a try each for the winners, Marais slotted two conversions and three penalties and fly-half Jean-Luc du Plessis one conversion. Winger Bautista Delguy had to leave the field injured soon after scoring the Jaguares’ only try and fly-half Joaquin Diaz Bonilla kicked a penalty. Lying 11th ahead of the match, the Stormers climbed six places to fifth in the combined standings and are second behind the Bulls in the South African conference. The Jaguares dropped one place in the combined table to 10th after a third loss in five outings and slipped to the bottom of the South African standings.